Here, unexpected guests drop in and offer information on potential forthcoming adventure! The squashed-up grid page of reference-heavy work is supposed to be a news item on television. For the grey-line frame of the flamboyant fellow in the hat, I’m going to create an engraving style frame based on old paintings of Francisco Pizarro. 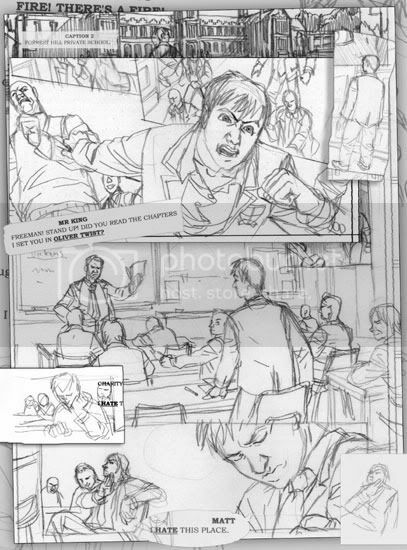 At the top of that block, there’s a bit of straight-up photo-ref, it’s a photograph of my ol’ PS2 console’s disc tray and my non-drawin’ mitt, standing in for Mr. Fabian putting a DVD on for the rest of the characters in the scene to watch. Hope you had a good 2011, and that 2012 will be even better. And could this be the end for Highly Questionable Santa..? Bill Eaton, the Gamesmaster (no not that kind silly), of our role-playing game group – referred to as ‘Geek Club‘ by all and sundry – has been slaving away over a hot Obsidian Portal ‘campaign wiki’ (will webby wonders never cease? I remember attempting to affect a similar thing a few years ago by trying to get the Wikipedia engine running on my web domain, to track all of the characters, locations and evidence in the Call of Cthulhu RPG ‘Masks of Nyarlathotep‘ campaign.) In the face of such community-spirited narrative-bolstering, I just had to do my thing and add a bit of art to the general flurry of activity. So this is me at Geek Club. 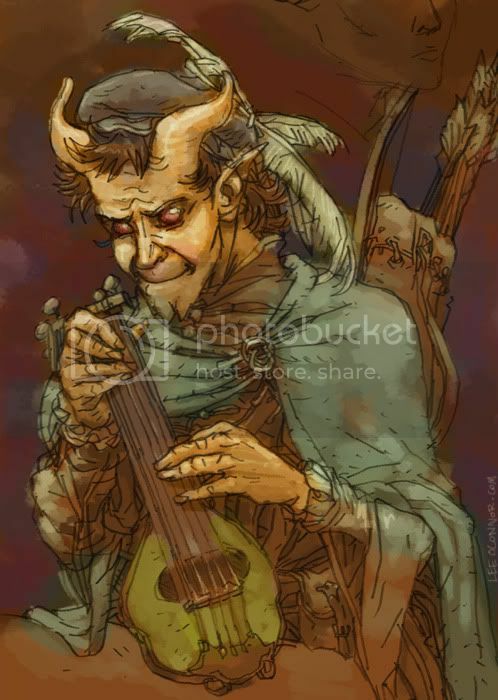 I’m a member of a race called the Tieflings, and get your spare change out, because I’m a Bard. You’ve got to love a bard. I came to paper-and-pencil, ‘table-top’ role-playing games as an adult. I’d spent much of my teenage years doing all kinds of reprehensible nerdy things, but never role-playing proper. Which is a shame, because it might have actually given me some much-needed social skills. But back to the present, Geek Club has played ‘WHFRP‘, Dark Heresy, Cyberpunk 2020, Savage Worlds: Pirates of the Spanish Main and (probably my favourite) Call of Cthulhu. It’s now that we’re finally truly living up to our name and having a go at most Geeks’ proto-game of choice, one ‘Dungeons and Dragons‘. Now, ‘D&D’ is big thing. It introduced roleplaying games to the world, and it was what most people cut their teeth on at an impressionable age. Not me though, I never had anything to do with it. So here’s a link to Bill’s wiki, any embarrassment I might suffer in people reading the earnest character fluff I put up on there is over-ridden by just how very good Bill’s adventure log of our half-arsed fantasy doings is. If you’re after another good Obsidian Portal site, have a look at the lovely Kieron Gillen and Quins from Shut Up and Sit Down‘s wiki for their WHFRP campaign, the magnificently-titled ‘Brash Young Fools‘. 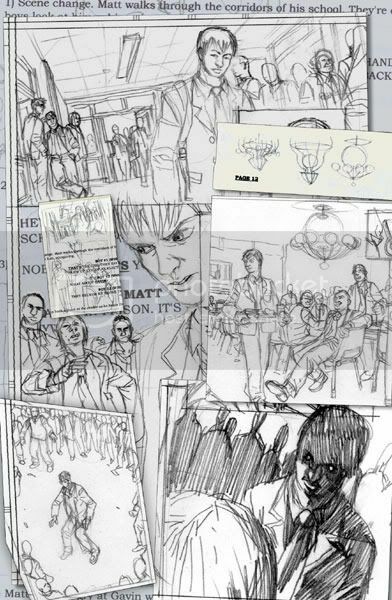 After the supernatural hullabaloo of Raven’s Gate, main character Matt’s shadowy group of new benefactors – ‘The Nexus’ – arrange for him to attend a new, exclusive, private school. This being the world of Power of Five though, things are never plain sailing. After saving the world from ancient demons, Matt has to deal with trying to fit in and lippy kids wanting to bully him. Ahh, the joys the secondary school. I even had fun designing what the story picks out to be a tawdry, modern chandelier in the school’s canteen. Can you guess what generally happens to fragile-looking things made out of glass in comics..? Yep. That. Toply-talented art pal Felipe Sobreiro got in touch last month, he was casting about his little black book of artists and asking them if they wanted to do a pin-up for the Image Comics series he’s colouring. I did! 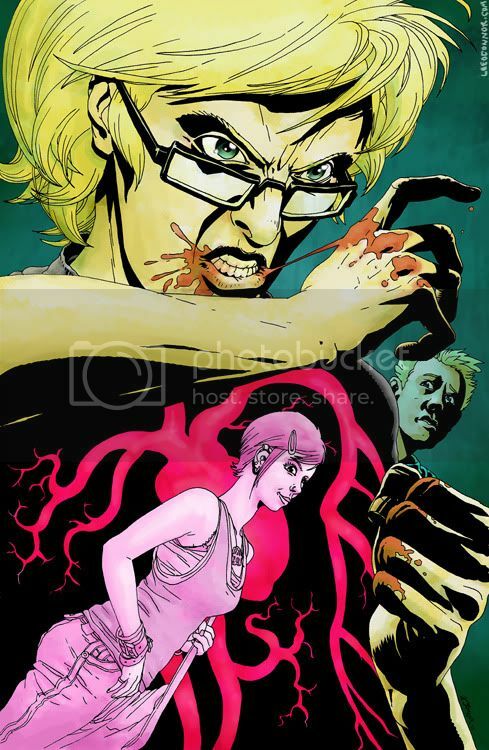 The Strange Talent of Luther Strode is a body horror mini-series written by Justin Jordan and pencilled and inked by Tradd Moore. 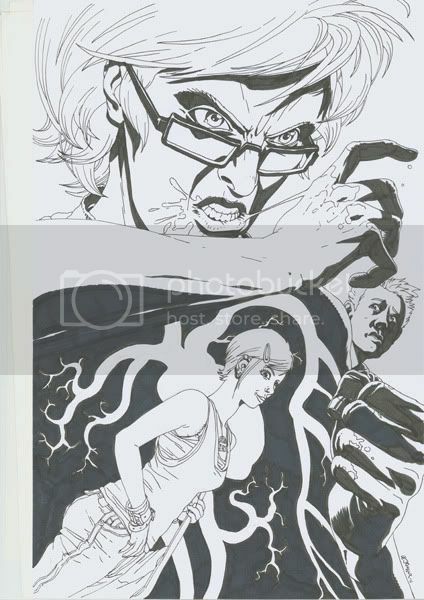 Here’s the inks as they hit the unforgiving flatbed of the scanner. 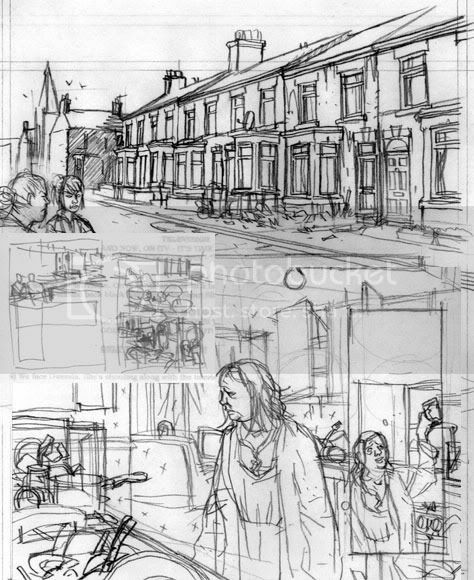 And finally some of the roughs and sketches I jotted down before embarking on the board for the pencils and inks. 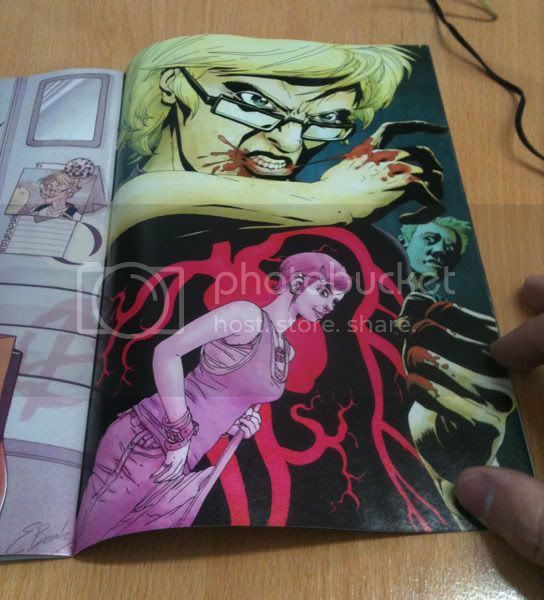 Here’s a photo that Felipe sent through of the piece in print! It’s in Issue #2 of the series. If it’s not in your friendly local comic shop, you can buy it online from Image Comics here. After having the most strange of vivid, portentous dreams, it’s time to have some good hearty breakfast. 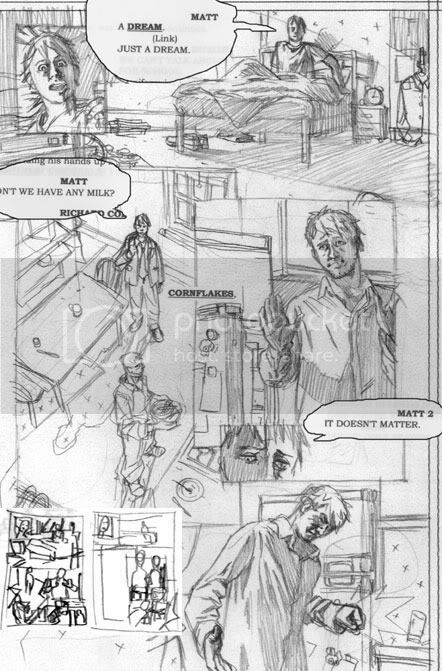 Matt – the main character of The Power of Five – lives with his big brother figure / guardian Richard, one of my favourite characters in the series. Anthony Horowitz (who’s writing The New Sherlock Holmes books, chappy) wastes no adjectives in describing him as a lackadaisical, unkempt, crumpled, untidy twenty-something. His flat is a mess and there’s nothing anything in the cupboards to eat. 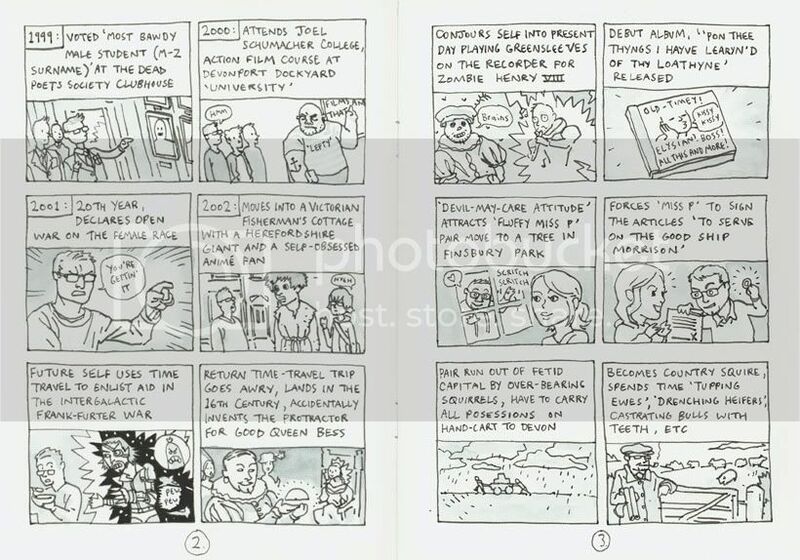 Even if you’ve just experienced a coded visual flash-forward of the events that are going to happen in the book. Here’s some pages from the birthday comic I gave to my pal and “heterosexual life friend” Rupert Morrison recently, since landmark birthdays deserve decent presents… Caution: In-jokes years in the making, personal histories and the fact I was half making this up as I went along conspire to make this mostly impenetrable to anybody but its original recepient. 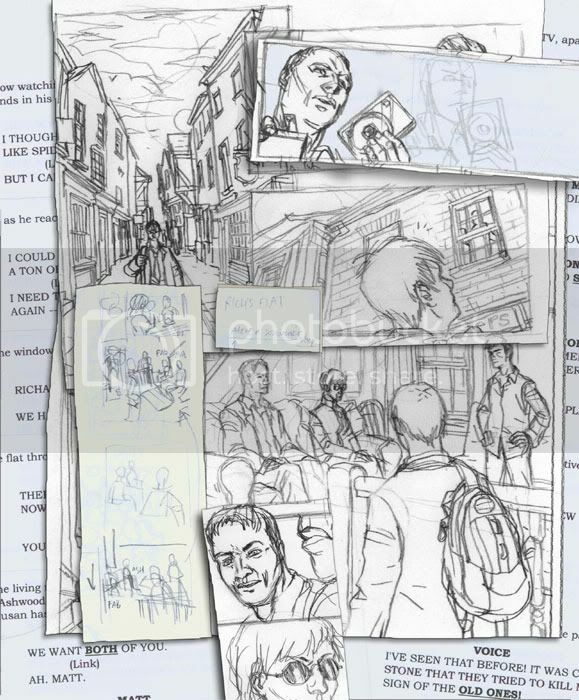 Of course this is just a cheeky glimpse for everybody else, there’s a colour cover, an extra page and the dedication in the actual art object itself, but unfortunately you’re not the dude in question, so ya nae privileged enough tae see it, man! In Evil Star, a character who was more-or-less a cameo in Raven’s Gate reappears – Gwenda – the main character Matt’s aunt and foster-mum. Things aren’t going too well for her and her husband Brian though, and she ends up becoming somewhat twisted supporting character. 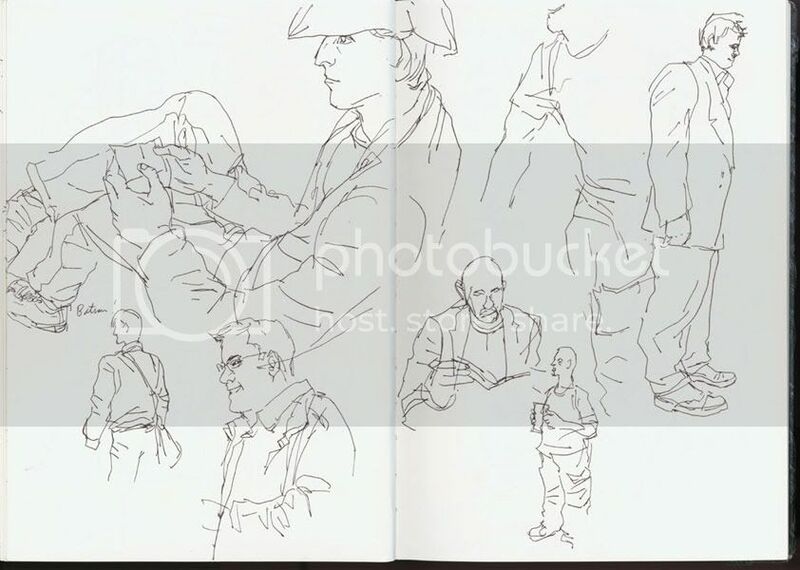 As I’ve alluded to before, whenever I’m out and about, I usually have a messenger bag slung across my back with a hardback, A4, usually Daler Rowney sketchbook in it. 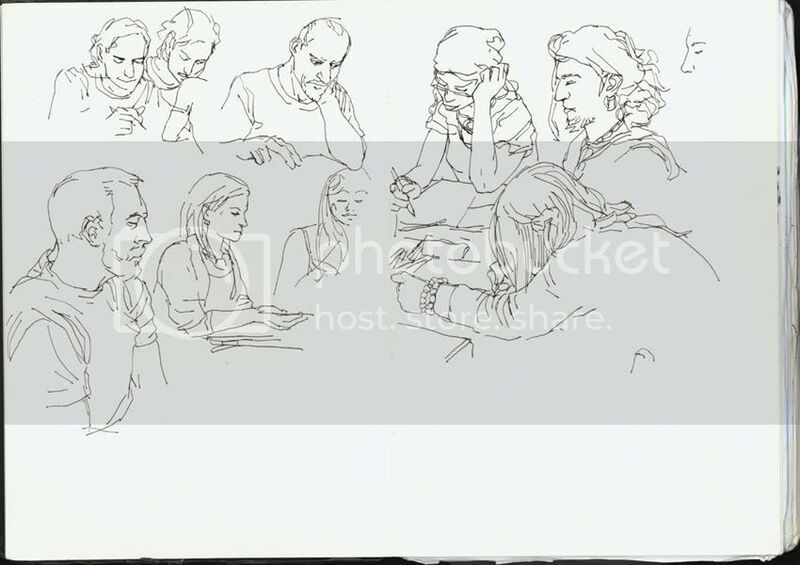 Depending on who I’m talking to, it’s either called ‘The Travelling Sketchbook’ or ‘The Pub Sketchbook’, since if I ever find myself out and about at a lose end without a comic script to thumbnail up, I’ll open it up and draw whoever’s around me – and if there’s no people about – then whatever’s around me. 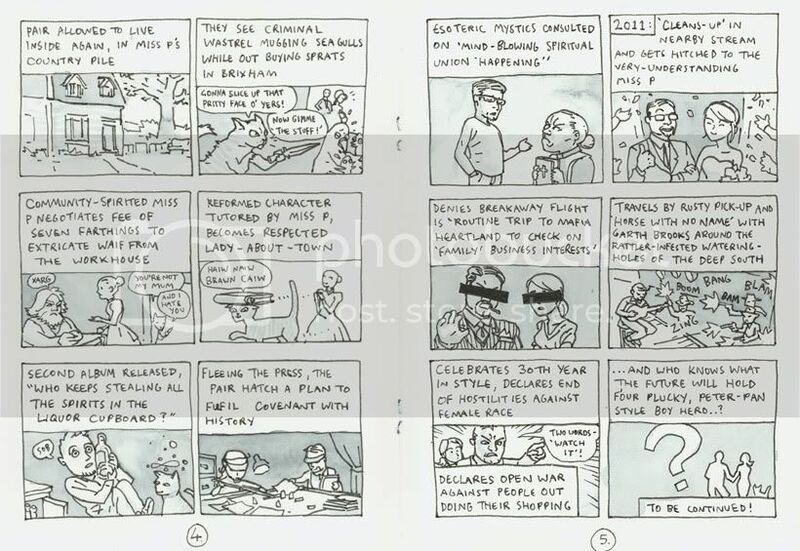 It’s all down to a fellow called Ron Tiner, a veteran illustrator who I was lucky enough to be tutored by at the comic-drawing-college-for-cool-kids ‘Sequential Illustration‘ course at Swindon College, at that point the only course of its time in the country. 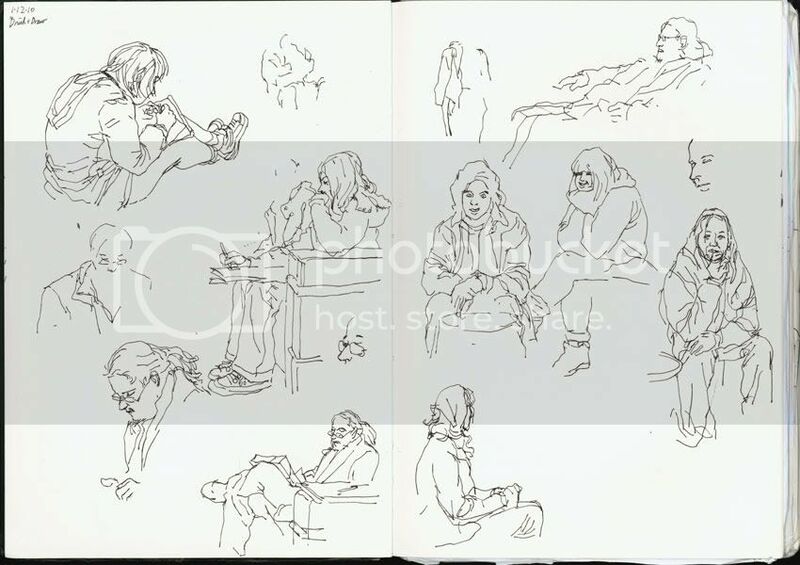 Apart from being One Of Us, Ron’s also responsible for one of the best figure-drawing books around, ‘Figure Drawing Without a Model‘, and also its follow-up, ‘Drawing From Your Imagination‘. 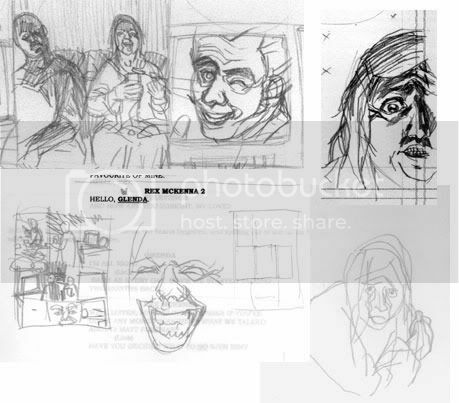 One thing you might not know is that when Dave McKean was working on the art for the famous Arkham Asylum Graphic Novel, he used Ron as the visual model for the character of Amadeus Arkham, the founder of a sanatarium who ends up going insane himself. An artist uses – and trades on – their visual memory, and if there’s nothing in it apart from a few stylistic ticks, then you’re buggered. 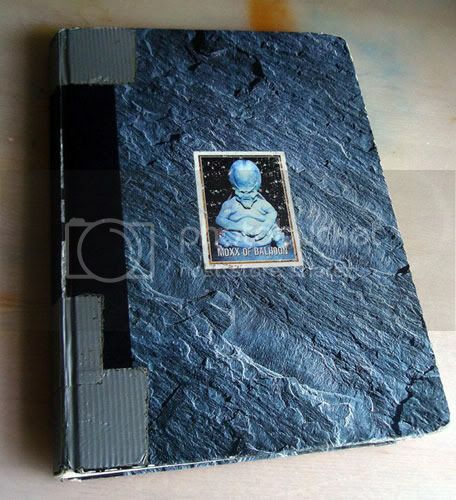 You won’t be drawing anything worthwhile or telling any good stories with that. 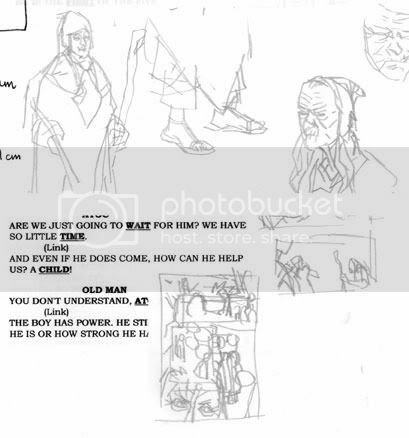 Drawing human figures and faces is one of the hardest things you can do, not only to comprehend what you need to do yourself as the artist, but your work must also to pass the test of being viewed by other people – human beings – whose human empathy towards other humans needs to be triggered by your scribbles. So yes, there you are sitting in the pub, waiting for some of your friends to turn up, you’re at a bit of a loose end, so it’s time to top up the visual memory. So off you go. Since Facebook‘s still with us, I thought I’d try and use it as a force for good(hah! 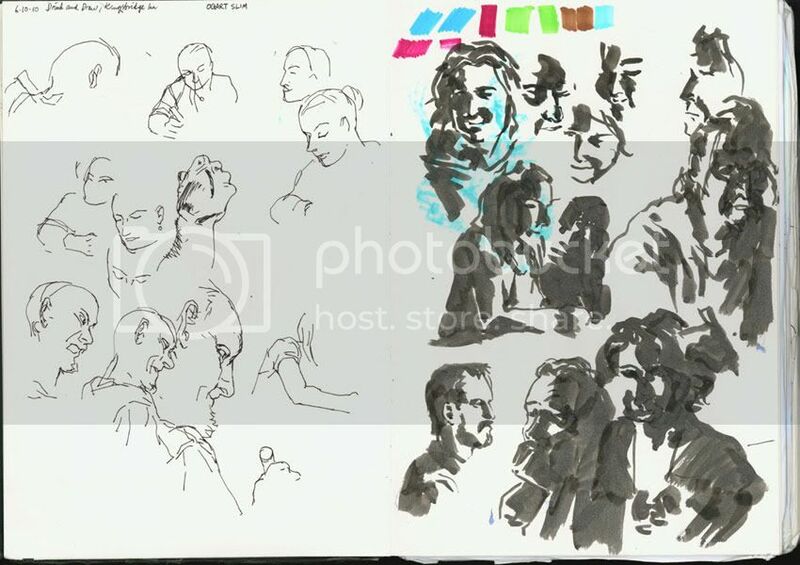 ), scan these sketchbook pages and put them up with the people in them ‘tagged’ (as the young people of today say) to serve as an alternative to all the cameraphone shots. The Facebook album with all the scans in to look at is right here. I said I’d lob up some workings from the Evil Star Graphic Novel, so here we go. 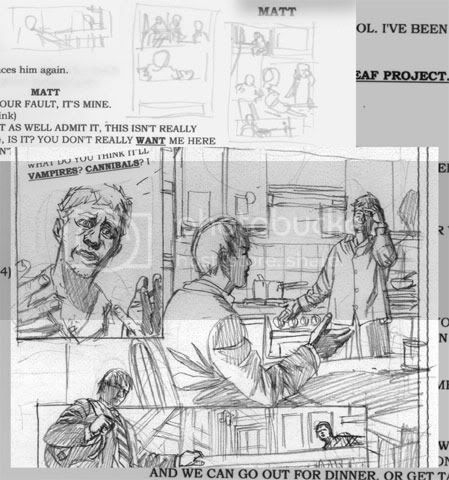 The plan is to make a regular series out of these: all the interesting pencils, layouts, thumbnails and scribbles on the script that never see print. 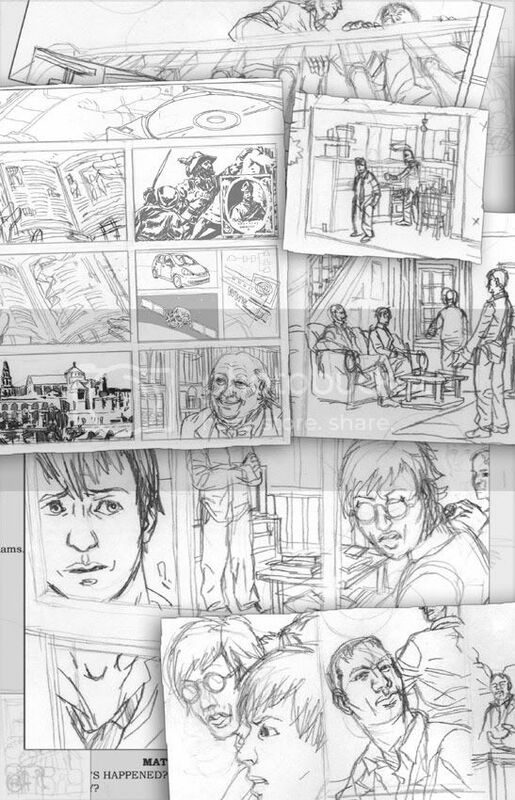 Starting at the beginning, this is some detail from the pencils – well, I’m calling them pencils, most comicy people would probably call them ‘breakdowns’ – for lowly page two of the one hundred and seventy or so in the book. 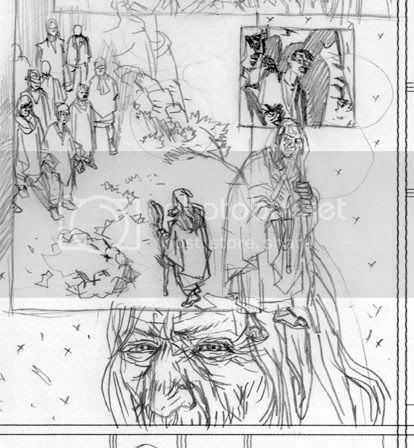 We open up the top of a tall mountain in the wilds of Peru, with an ‘Amauta’ wise man making predictions on the future for the story and the characters. 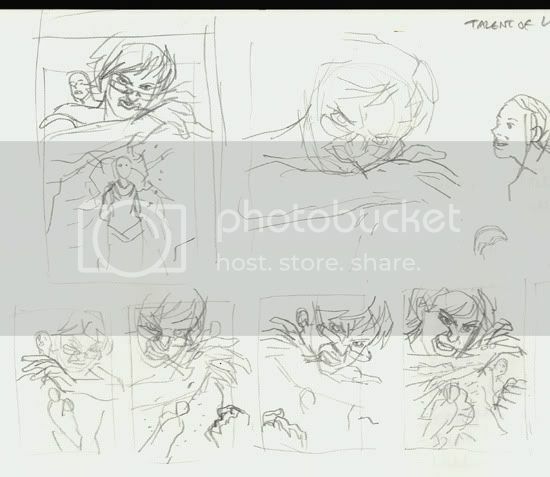 I seemed to remember the scribbles being tighter than this, but don’t worry, they’ll get better as they go on.